From European explorers to Native Americans and U.S. Cavalry, every corner of Yosemite National Park offers a piece of history. Gold mining in the 1800s brought thousands of prospectors to the Sierra Nevada foothills, after which, word of Yosemite’s spectacular beauty spread and eventually Yosemite Valley became America’s first public preserve. Since then, the region has captured the hearts of travelers from across the country. Yosemite offers visitors a broad range of inspiring and interactive programs. Vacationers can learn intriguing facts about Yosemite by speaking to Rangers, attending lectures or participating in guided walking tours. Guests can also spend time at the Yosemite Theater, where interesting, educational multimedia presentations and films can be viewed. Bicycling and hiking are two all-time favorite pastimes in the Park. Hundreds of trails exist for both activities and vacationers will find outstanding photo opportunities throughout the park. Thousands of visitors make their way to Yosemite each year to enjoy some of the best fishing in the country. A broad range of freshwater fish can be caught and fried on-site for a tasty lunch or dinner. Some people enjoy experiencing Yosemite’s true wilderness and wild lands. Those who want to backpack and sleep under the stars are pleased to discover that a wilderness permit, bear canister, and information on the back country is available at the park office. Prospective travelers can visit the National Park Service website for additional information on planning their trip. 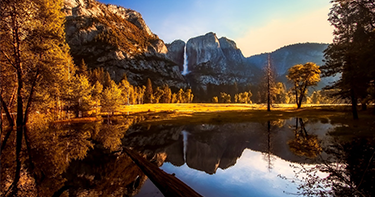 Regardless of when one visits Yosemite, he or she is virtually guaranteed to have an unforgettable vacation. Most campgrounds are quite full from mid April to mid September, and the majority of campsites require reservations. However, vacationers who want to “wing it,” can take their chances on a first come, first serve basis, although this is not recommended during peak season. Sewer, water and electrical hookups are not available in Yosemite, but fresh water dump stations can be found year-round at the Upper Pines Campground, and during summer at the Wawona Campground. Generator use is permitted between 7AM-9AM, 12PM-2PM, and 5PM-7PM. Storing food in hard-sided trailers and RVs is permissible, provided food is out of sight, and vents, doors and windows are securely closed when the travelers are not at their campsite. Food storage is prohibited in tent or pop-up trailers, or other soft sided campers. The maximum RV length allowed in Yosemite Valley is 40 feet, with 35 feet being the maximum allowable trailer length. It is important to understand that trailer length and RV length are different. Numerous campsites are laid out for back-in parking, and feature a turning radius that is somewhat limited.